Thorlabs’ multidisciplinary OEM applications engineering team is ready to design and build a custom Elliptec piezoelectric motor solution for your application. The highly dynamic and high-precision Elliptec motors are favored for their simplicity of assembly and operation, as well as their compact dimensions, light weight, and low power consumption (see the Technical Data tab). Our Multi-Position Sliders and Linear Stages showcase the smooth linear movement enabled by these piezo resonant motors and demonstrate that they are ideally suited for integration into a wide variety of end-applications, including those requiring the actuation of shutters and lids, the adjustment of beam-deflection mirror alignment, the toggling of locks, or the selective engagement of filters. In addition, Thorlabs’ automated manufacturing facility in Dortmund, Germany enables the high-volume production of motors capable of meeting your needs. By working closely with you, each integration is tailored to meet the specific complexity, dimensional, and pricing requirements of the application. 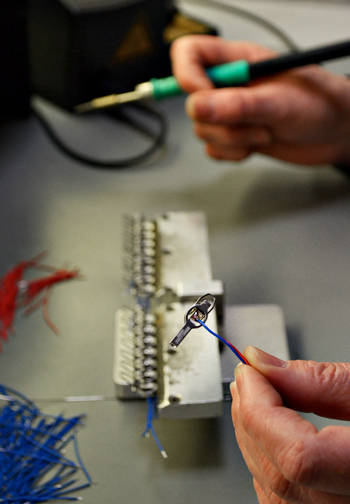 Thorlabs’ team is experienced in implementing a range of design solutions, from the most basic mechanical sub-assembly to fully self-contained electromechanical assemblies with integrated drive electronics. 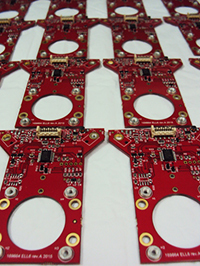 In addition to performing custom design and manufacturing services, Thorlabs can complete final assembly and functionally test every OEM unit before shipping. Thorlabs takes pride in meeting the unique needs of your OEM application. Each project begins with a dedicated account manager establishing a strong collaborative relationship between your team and the technical resources at Thorlabs. Discussions with you are held to establish detailed design specifications, define performance goals, and identify system requirements. Thorlabs uses this information to propose the most appropriate custom design and associated manufacturing solution. Finished designs, based on modelling results, describe the manufacturing process and specify the constituent materials. Three-dimensional mechanical modeling for the project is performed using computer-aided design (CAD) software, and mechanical stress analysis is conducted using the software’s associated finite element analysis (FEA) tools. Based on the requirements of your application, electronics schematics are generated and board layouts are designed, such as the boards shown in the image at left. Thorlabs has the ability to model the mechanical components and the electronics together, which produces truly integrated designs. Materials and associated manufacturing techniques are carefully chosen to suit the application, as these have a direct influence on the operation and cost of the assembly. Candidate materials for component fabrication include both metals and plastics, and Thorlabs routinely designs for a wide variety of manufacturing techniques including machining, molding, and casting. The Implementations tab highlights these capabilities by including summaries of and links to products based on the Elliptec motor. Please contact us today to discuss integrating the exceptional Elliptec motion control motor technology into your application. At the core of the Elliptec piezoelectric resonant motor is the piezo element, which is press-fit into an aluminum motor frame. The frame is more than just a physical housing; it is also a resonator and a transducer, and it has been designed specifically to interface with the piezoelectric element (see The Elliptec™ Motor tab for additional details). During operation of the motor, the oscillations of the driven piezoelectric element are amplified by the frame and converted to an elliptical motion at the frame's tip. An attached spring presses the machined tip of the frame into firm contact with the driven element, which may be a rotor or other component. Power is supplied to the piezoelectric element through wires soldered to its upper and lower surfaces. The motor's direction of motion is changed and its speed is tuned by adjusting the ultrasonic frequency of the applied signal. 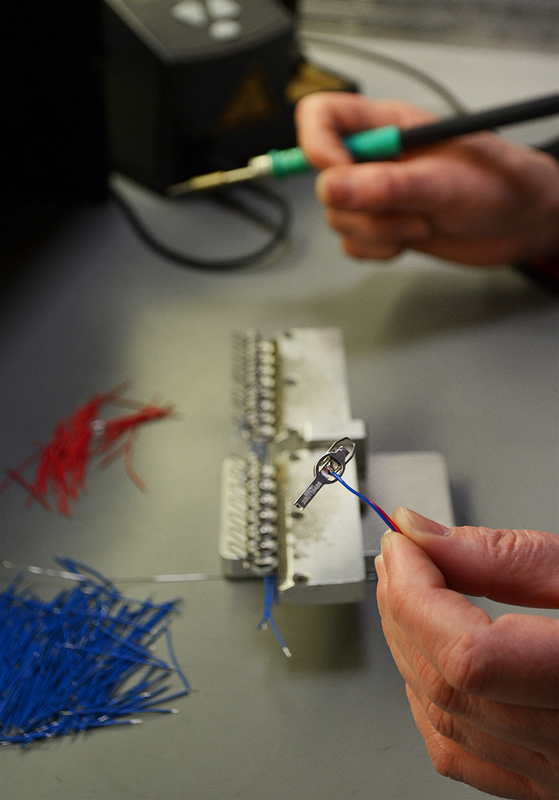 The orientations of the spring and wire leads are chosen to suit the application, as are the lengths of the wire leads and whether or not they are terminated. The specifications listed here describe the typical characteristics of the Elliptec piezoelectric resonant motor, when it is operated under open-loop and unloaded conditions. The motor is shown being held, by the wire leads soldered to its piezoelectric element, in the image at right. The majority of applications employing the motor will incorporate it into an application and operate it under loaded conditions. When this is the case, the performance of the motor is highly dependent on the design characteristics of the system. For example, implementing the loaded motor in a closed-loop system can achieve a positional resolution of 0.5 µm, while the step size of the unloaded motor running under open-loop conditions is 10 µm. Please see the Overview and Implementations tabs for discussion of the performance that can be achieved when the motor is operated under loaded and closed-loop conditions. The piezoelectric resonant motors integrated into all designs share dimensional, weight, and frequency response characteristics. 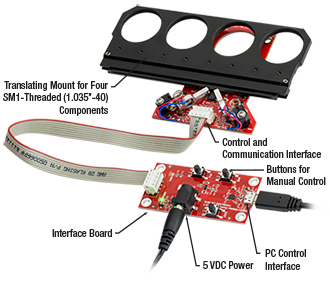 Control the movement of any of these devices by pressing buttons on the interface board, through computer control via the Elliptec software package that is available for download, or by sending simple signals to digital lines on the device PCB. All of these methods can be used to simultaneously control mixed networks of up to 16 individual devices. See the Specs tab on the ELL6K and ELL9K product page for complete specifications. Thorlabs' ELL6K Dual-Position and ELL9K Four-Position Slider packages are designed to exchange mounted optics for one another in an optical path. The ELL6K mounts two SM1-threaded optics and the ELL9K mounts four. Both sliders are lightweight and compact, with the four-position slider weighing 70.0 g and having dimensions of 141.0 mm x 77.7 mm x 14.2 mm when the carriage is in one of the end positions. The ELL6 features one Elliptec motor, while the ELL9 has two of these highly dynamic motors. As they have no gearing, the motors can stop within microseconds. This allows the motors to respond quickly to signals from the photoelectric sensor and accurately position the slider. In addition, the motors include no magnets, which makes them compatible with EM-sensitive environments. 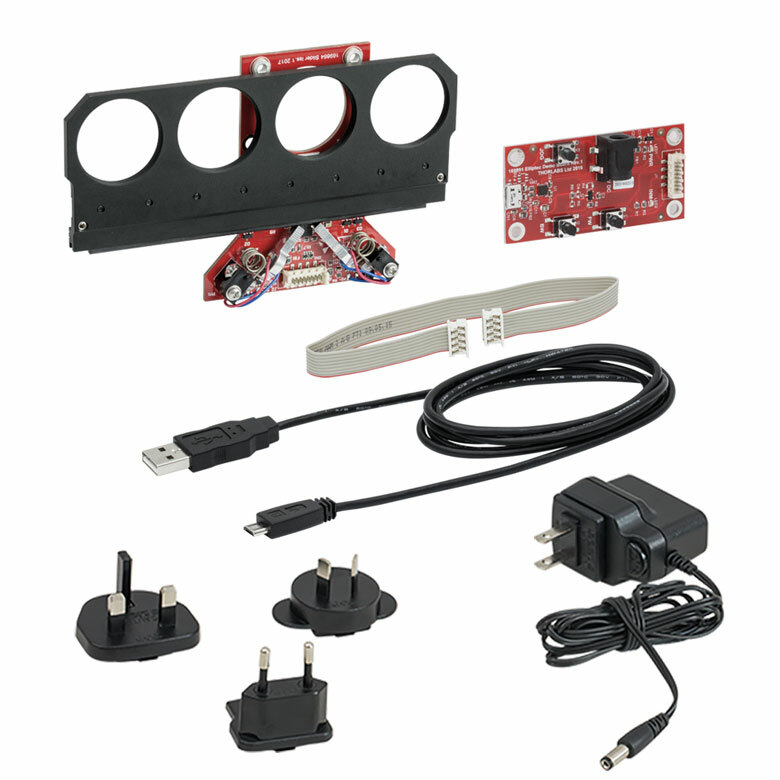 The contents of the ELL9K bundle are pictured at the right, and components included with the ELL6K and ELL9K and listed in the table at the right. The movement of the slider may be controlled by pressing buttons on the remote handset, through computer control via the Elliptec software package that is available for download, or by sending simple signals to digital lines on the slider board. The ELL6K dual-position and ELL9K four-position sliders are well suited as a filter changers, and the ELL6K is also used as a shutter. The sliders possess SM1-threaded (1.035"-40) bores, with 3.5 mm deep threads, at each position. Four 4-40 tapped holes on the PCB allow the sliders to be mounted with and integrated into optical setups using Thorlabs' 30 mm Cage System. See the Specs tabs on the ELL17K and ELL20K product pages for complete specifications. 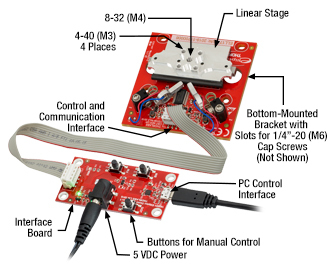 Thorlabs' ELL17K(/M) and ELL20K(/M) Linear Stage Bundles are designed to be a compact solution for OEM applications requiring linear movement. The ELL17K provides 28 mm of travel and the ELL20K provides 60 mm. Both stages are lightweight and compact, with the 60 mm stage weiging 0.069 kg and requiring no more than 162.3 mm x 67.0 mm of space to accomodate the PCB and the full travel range of the stage. The stages feature two Elliptec motors. As they have no gearing, the motors can stop within microseconds. 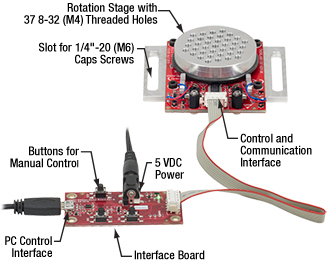 This allows the motors to respond quickly to signals from the photoelectric sensor and accurately position the stage. 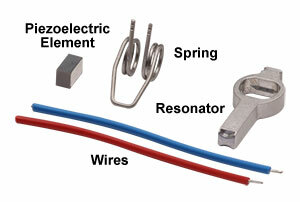 The contents of the ELL17K(/M) bundle are pictured at the right, and components included with the ELL17K(/M) and ELL20K(/M) and listed in the table at the right. The movement of the stage may be controlled by pressing buttons on the remote handset, through computer control via the Elliptec software package that is available for download, or by sending simple signals to digital lines on the stage board. The stage feature one 8-32 (M4) tapped hole and four 4-40 (M3) tapped holes for mounting posts or MMP1(/M) or RB13P1(/M) top plates. The mounting bracket that comes with each kit has two slots for use with 1/4"-20 (M6) screws for mounting to an optical table or breadboard. See the Specs tab on the ELL18K(/M) product page for complete specifications. Thorlabs' ELL18K(/M) Rotation Stage Bundles are designed to be a compact solution for applications requiring rotational control. The Ø50 mm rotation stage has 37 8-32 (M4) tapped holes for mounting optomechanics or custom assemblies. With a mass of 90 g and maximum dimensions of 81.0 mm x 60.0 mm x 20.3 mm, the rotation stage is lightweight and compact. The stage features two Elliptec motors. 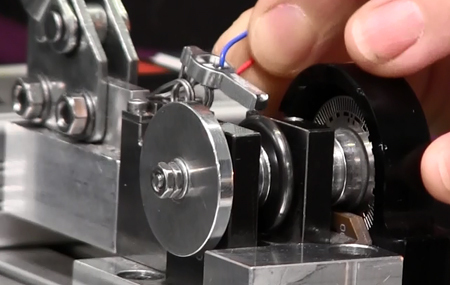 As they have no gearing, the motors can stop within microseconds. This allows the motors to respond quickly to signals from the photoelectric sensor and accurately position the stage. The contents of the ELL18K(/M) bundle are pictured at the right, and the components included are listed in the table at the right. The movement of the stage may be controlled by pressing buttons on the remote handset, through computer control via the Elliptec software package that is available for download, or by sending simple signals to digital lines on the stage board. 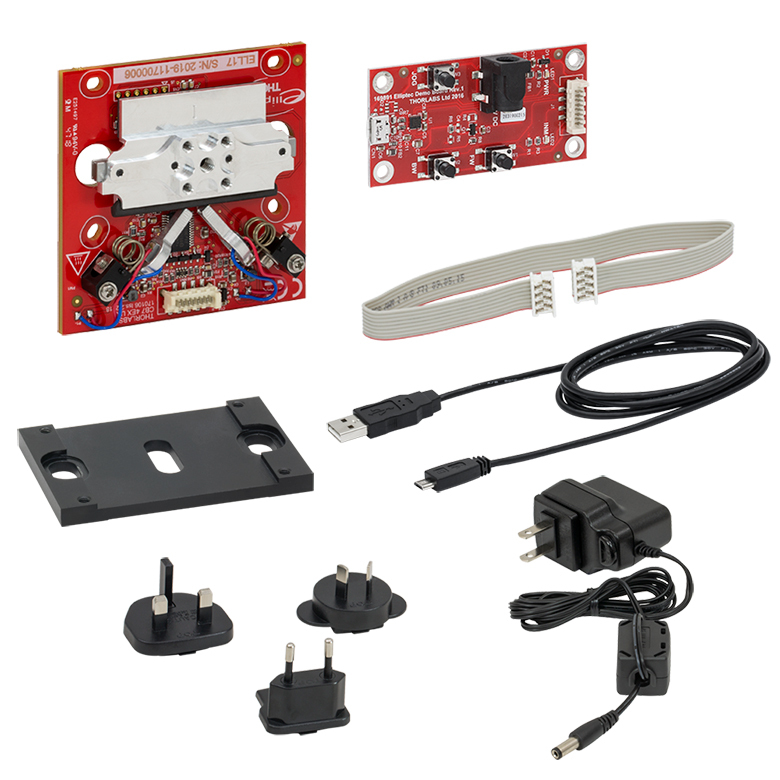 Each bundle comes with two mounting brackets which provide slots for 1/4"-20 (M6) screws for mounting to an optical table or breadboard. Thorlabs' Elliptec™ piezo resonant motor, shown at right, is lightweight, with a mass of 1.2 g, and compact: the dimensions of the resonator housing, excluding the spring, are 8 mm x 4 mm x 20 mm. The components that compose the motor are shown at far-right. 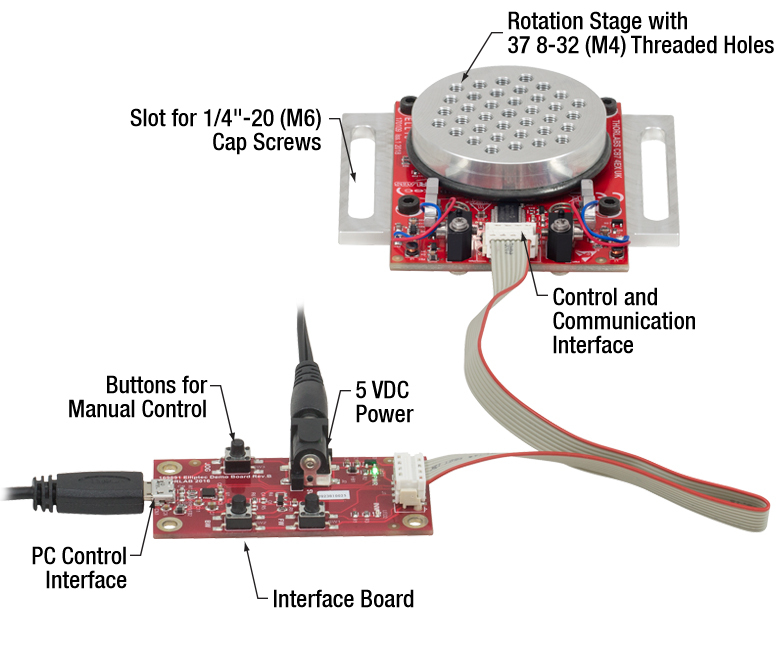 The piezoelectric element is press fit into the aluminum resonator, which has been precisely designed and machined to produce the desired elliptical motion at the tip and to interface optimally with the driven module. The free ends of the spring are integrated with the resonator housing. The wires, which are soldered to the top and bottom of the piezoelectric element, deliver the voltage signal that induces the piezoelectric element to vibrate at ultrasonic frequencies. When the motor is built into a system, the open loop of the spring is bolted to a sturdy surface that is stationary with respect to the item to be driven, and the tip of the resonator is placed in contact with the item. 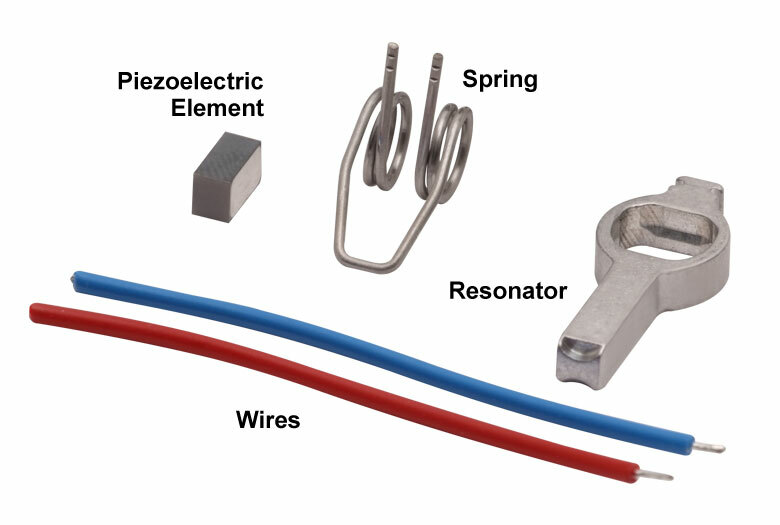 The purpose of the spring is to maintain constant contact between the tip of the resonator and the driven item, and the direction of motion is determined by the resonance frequency at which the piezo element is driven. Elliptec motors quickly and precisely position stages and mounts while never seeming to move. Their microscopic movements occur at ultrasonic frequencies and are invisible to the naked eye. The motor is operated by driving it at one of its two resonance frequencies. A voltage signal oscillating at an ultrasonic frequency is applied to the piezoelectric chip, which responds by expanding less than a micron and then contracting back to its original dimensions at the frequency of the driving signal. This rapid-cycling change in the chip's dimensions causes a vibration in the aluminum resonator housing. When the vibration is at one of the housing's resonance frequencies, a pushing motion results at the tip of the motor. When the vibration is at the other resonance frequency a pulling motion results. As illustrated in the video, the pulling and pushing motions result from the tip of the motor tracing an elliptical path in space when the motor operates at resonance. The selected resonance frequency controls the direction of the cyclical motion. The motor's tip traces one half of the ellipse as it expands and the other half as it contracts. When the motor pushes the driven item, the motor's tip is in contact with the item while the tip expands; the two are not in contact while the tip contracts. The converse is true when the motor pulls the driven item in the opposite direction. The total displacement at the tip of the motor is a function of both the mechanical load it is driving and the voltage supplied to the piezo element. The maximum displacement can be up to a few microns when the peak driving voltage is 5 V.
The motor behaves in many ways like a DC or electromagnetic stepper motor, but it does not suffer from many of the drawbacks of these conventional motors. Unlike conventional electromagnetic motors, which must overcome inertial delays to come to a stop, the highly dynamic Elliptec motor can stop within microseconds. As it has no gears, it does not exhibit backlash. Since it possesses no magnets, it is compatible with use in environments sensitive to electromagnetic interference. The motion of the driven element is continuous and smooth. 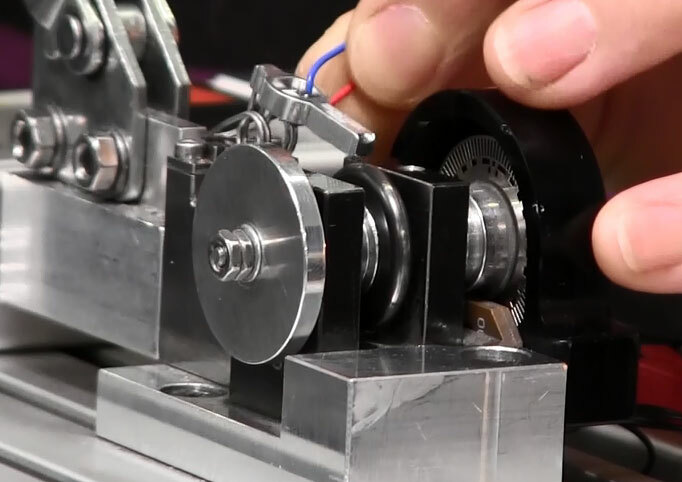 As the tip of the motor must be in contact with the driven item to induce motion, the motor possesses the safety feature of an inherent friction brake. When in contact with a plastic surface, the motor operates virtually silently. For OEM applications, the motor can be manufactured in volume at low cost, and it can be driven by inexpensive analog electronics. It does not require microprocessors or software; however it is compatible for use with them. Hi, We are using several of elliptec rotation motors and one of them malfunctioned recently. Is is possible for the motor to be replaced or repaired? Response from Radu at Thorlabs: Hello, Aqeel. Unfortunately we can't replace those stages at the moment, but we can still repair them, depending on what the issue is. I will contact you directly in order to troubleshoot your device. Hello, I own several Märklin railway models with this fantastic motor. Is it possible to purchase some of them as spare part in case of an defect? Response from Arunthathi @ Thorlabs: Thanks for your query. I have spoken to our Elliptec team regarding your requirement and you will be contacted directly. Running the Elliptec motor at 80khz in the air without an external load. Is the sound silent? Response from Radu at Thorlabs: The motor may or may not be noisy at 80kHz. If it is driven at its optimal frequency, then it is silent. If not, then it can emit an irritating noise. The optimal frequency depends on multiple factors, including load and mechanical variances. If the default value makes the stage noisy, then I recommend you sent a _HOSTREQ_SEARCHFREQ_MOTOR command, followed by a _HOSTREQ_SAVE_USER_DATA command. This will re-set the driving frequency of the motor and amend the problem. Unloaded Elliptec™ Motor What are the prices for the motors? Response from Arunthathi at Thorlabs: Thanks for your inquiry, I will contact you directly regarding your requirements and discuss pricing. What material is used for the Elliptec spring? Can a fully non-magnetic/non-ferrous version be made? Response from Arunthathi at Thorlabs: Thanks for your query. The Elliptec motor has a ferromagnetic spring, as it is the integral part of the motor we are unable to custom make or replace the spring to make a non-magnetic version.